As I described in “Heads Up: The 5 Hidden Expenses of Open Ceilings,” open or plenum ceilings come with hidden costs that should be considered before a build-out is planned. One of these costs is dealing with loud and distracting spaces created by them in conjunction with the popular open floor plans of contemporary offices. Without enclosed offices or high cubicles to retreat to, the cacophony of conference calls, impromptu meetings, and even innocuous email alerts and typing sounds can be overwhelming. Ignoring the issue may lead to decreased employee productivity, feelings of privacy and job satisfaction. Noisy spaces may also make a poor impression on clients or lead to costly mistakes caused by misheard or overheard sensitive information. White noise systems mask some noise, but employees may find the artificial noise itself to be a distraction. 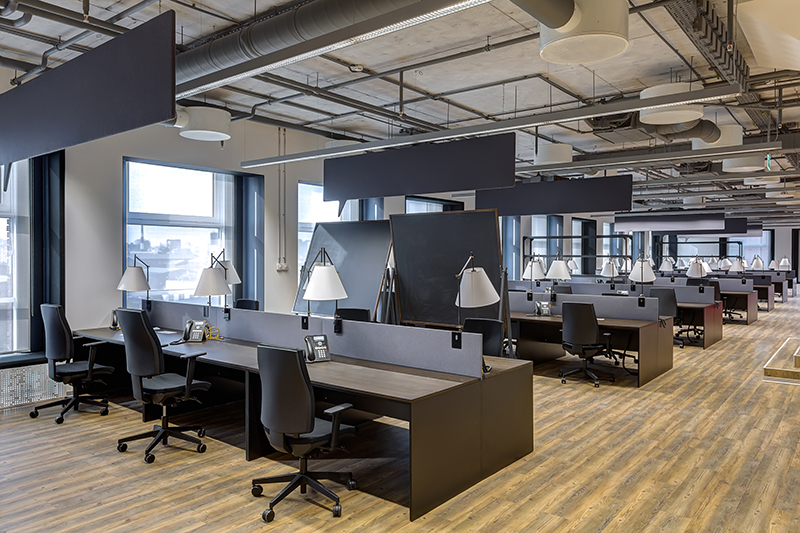 For open offices, acoustical sprays are increasingly popular for replacing the effect of the acoustical tiles that compose drop ceilings. The biggest downside from a build-out perspective is that all other site work must pause for a week or more while the acoustical spray is applied. The cost of the materials and labor to install acoustical sprays should also be factored into the budget. Creating inviting retail and restaurant interiors not only has to do with how they look, but also how they sound. Customers may avoid restaurants where the ambient noise level makes it hard to have a private conversation or retail spaces where they must shout to receive service. Getting the industrial look without industrial noise requires using construction and interior design solutions that help absorb sound. In addition to acoustical spray, the team may want to incorporate banquettes or booths, upholstered furniture and carpeted areas, as well as curtains, wall hangings or other textiles. These measures create the potential for many new design choices, and add cost and time to your build-out, so they should be planned for accordingly. Open ceilings and other contemporary design choices will continue to be popular because of their sleek, stylish looks. But, make sure not to neglect hearing when you’re designing to please the senses. One of the biggest complaints about work and retail spaces with these features is their noisiness. With some advanced planning and investment, using acoustical spray, white noise, and furniture and textile choices can help alleviate the echo effect that open ceilings create. This is the two in a two-part series on pros and cons of on-trend office and retail design elements. Read part one of the series, Heads Up: The 5 Hidden Expenses of Open Ceilings.